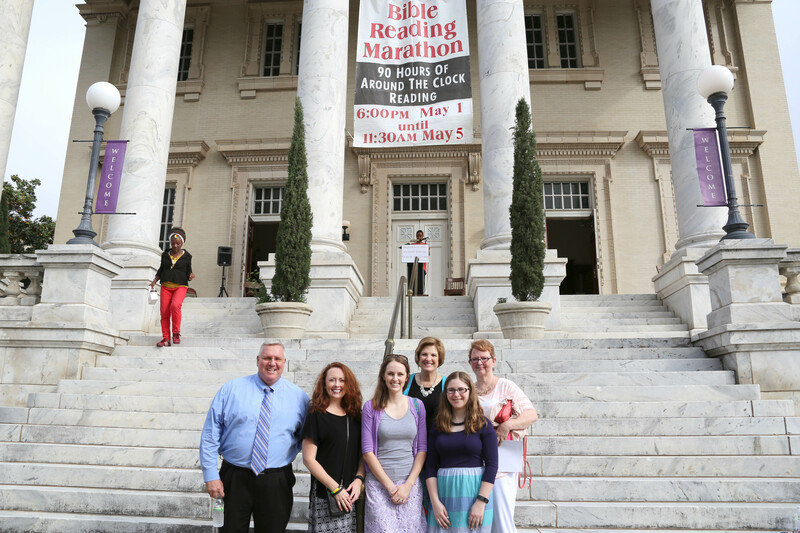 BIRMINGHAM (TAB) — Members of The Alabama Baptist staff participated in this year’s Birmingham Bible Reading Marathon, which began May 1 at 6 p.m. at Southside Baptist Church, Birmingham. Four staff members read passages through Deuteronomy and two other staff members took photos and shared updates on Facebook. Other Bible Reading Marathons also are taking place in Ozark, Troy, Tuscaloosa and Montgomery this week and all will conclude on May 5, the National Day of Prayer. To see open slots available to read in Birmingham, click here. Look for a story on the Bible Reading Marathons across the state in next week’s issue of TAB. This entry was posted in Home and tagged Birmingham Bible Reading Marathon, National Day of Prayer, The Alabama Baptist. Bookmark the permalink.